Be Up & Running Faster. Locations available across the country. Who We Are: Auto-Lab is a growing, complete car care center franchise that offers competent diagnostic repair service at an affordable price. Convert your location to boost sales and conquer your market. Auto-Lab Is Your Greatest Choice For Automotive Franchise Opportunities in Michigan ! Do you dream of opening your own automotive repair and service business but are afraid to take the plunge? As a growing car servicing franchise system that offers a complete range of diagnostic services and repairs at competitive prices, Auto-Lab offers fantastic franchising opportunities for those who are interesting in joining the ranks of small business owners. In general, the automotive industry offers many benefits for those seeking franchise opportunities. The industry is both large and able to withstand recessions well. Unlike other franchise types such as food or retail, automotive franchise services cannot be outsourced and do not face competition from online retailers. Furthermore, consumer demand for the services of automobile repair shops is high as the average age of cars in the U.S. increases and owners face a growing need to find affordable service for their out-of-warranty vehicles. Auto-Lab's service focus is solely on automobile diagnostics and repairs; this specialization allows our franchises to offer an affordable alternative for their customers as compared to dealership service departments and other repair shops. Why Choose Auto-Lab For Your Franchise Opportunities? Our business model makes the dollar investment in an Auto-Lab franchise less expensive than most other automotive repair franchise systems. Our sole focus on diagnosis and repair services makes Auto-Lab a less expensive alternative for our end retail customer than both automotive dealerships and most other independent repair shops. To become part of a business culture and commitment to integrity, honesty, fair pricing, and community involvement. To gain access to a robust training program. To gain access to a proprietary business management system (ALBMS®) that integrates the point of sale quoting and invoicing process, the inventory management process, and the back-end accounting function. To gain access to pre-negotiated parts and equipment vendor programs. To gain access to our 12 month / 12,000 mile warranty program. To derive the benefit of our on-going franchisee support services. Many Americans dream of opening their own business, but often the risks of setting out on your own seem too great to overcome. Perhaps you've considered searching for an auto repair shop for sale, but you have concerns about your ability to start from scratch all on your own without support. For this type of would-be business owner, the benefits of franchising can be incredible. As a franchisee, you will be able to realize your dream of owning your own business. Unlike starting your own company, however, you will not need to take on the startup risks associated with a new business; as a franchisee, you will be entering into a partnership with an existing and established company that has already laid the groundwork and created a viable business model. Founded in 1989, Auto-Lab began as a single store auto repair facility located in Sturgis, MI. The company quickly grew to five independent facilities focusing on tune-up and diagnostic services. Due to the success and growth of these sites, the company made the strategic decision to begin offering franchise opportunities in 1992. Since that time, the Auto-Lab franchise system has grown to upwards of 30 locations located in Michigan, Indiana, Iowa, Florida, and Texas. Auto-Lab Complete Car Care Centers has been a part of local communities for 27 years and continues to provide franchisees a business model that contributes to positive community outreach. The company holds an A+ BBB rating, and stresses the importance of exceeding customer satisfaction in each location. Why Auto-Lab versus another auto repair franchise? Auto-Lab offers an immense amount of franchise support from our corporate office as well as a highly respected brand image. We require less investment, a small franchise fee and more control of marketing and advertising associated with your target customer base. The Auto-Lab Business Management System (ALBMS®) is a computer program unique to Auto-Lab that will assist you in all areas of managing a successful Auto-Lab Complete Car Care Center. 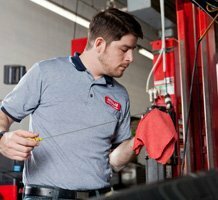 Do I have to be a service technician to own an Auto-Lab franchise? No. A common misconception of our industry is that you have to be a service technician to own an auto repair center. While you will need to employee ASE Certified Technicians to work in your Auto-Lab Complete Car Care Center, any mechanical expertise that our franchises may have is often an added bonus. The most useful asset to an Auto-Lab franchisee is proven success in the management of a business. In fact, several of our most successful franchisees are not auto repair technicians; they range from chemical engineers to business executives, but have all found success by utilizing the Auto-Lab business model and brand. A basic knowledge of business management fundamentals. A strong work ethic and commitment to honesty and integrity. Personal liquidity of at least $250,000. Auto-Lab is the leading choice for auto-repair franchise opportunities in Michigan ! Request info today on how to become a successful franchise owner of your very own Auto-Lab! The contents of this webpage are Copyright © 2019 Auto Lab-Franchise. All Rights Reserved.